Foot creams are a type of product that are used by both, men and women. Foot creams are utilized in copious amounts across the world for the sole reason of moisturizing your feet. Furthermore, these creams also help to treat dry skin and other foot-related conditions. One such product is the AHAVA Mineral foot cream which you can read about in-detail below. Just as we take care of all parts of our body, we should also make sure that our feet are given the right treatment and they don’t look dry. Our feet usually become one of the most overlooked parts of our body and you may start to have cracked heels, itchy or red spots, dry skin, and callouses. As people are becoming more conscious about the health of their skin, many different types of products like foot creams are springing up to satisfy the increasing demand. The AHAVA Mineral Foot Cream is one such product that can fulfill your needs. The AHAVA Mineral Foot Cream is a product that is specially designed to soften your skin. If you have cracked heels or dry skin, then this cream can help cure those problems. There are some ingredients in this cream that make it different from your typical foot cream and make it an efficient and natural moisturizer. These ingredients include Ostomer and other natural extracts. Your feet will become hydrated and smooth after applying this product. This fruit is full of Vitamin E, a nutrient which has many anti-aging benefits. Avocado also contains antioxidants which help your skin look younger and smoother. It removes dead skin cells from your skin and also protects your skin from harmful external factors. Wheat germ is a natural and organic ingredient which not only has a positive effect on your skin but also boasts a high nutritional value. Its anti-aging and antioxidant properties help the skin tissues of the feet remove the oxidative stress which occurs because of increasing free radicals. Wheat germ also repairs skin tissues and hence it helps in replacing dry, cracked skin with more stronger, smoother, and firmer skin. Sweet almond is an important component and one which contains a high level of nutrients which include vitamin A, B, and C. This ingredient is also popular in many other moisturizing creams as it helps in maintaining the perfect moisture level of your skin. The concentration of sweet almond found in this foot cream boosts skin clarity and helps to improve your skin complexion. It also moisturizes your skin completely, provides comfort to itchy, irritated and dry skin and also makes your skin softer, firmer, and smoother. Jojoba oil is suitable for those people who have dry and scaly skin. Jojoba oil is different from all other water based moisturizers as it does not evaporate and hence protects your skin for a long time. The AHAVA Mineral Foot Cream contains high concentrations of jojoba oil which means that you only need to apply a small amount in order to moisturize and nourish your feet fully. Aloe Vera is one of the vital and earliest ingredients in the field of skincare. It deeply hydrates the skin which thus produces a calming and relaxing effect and also cures tired and chapped feet. Tea tree leaf oil is an essential anti-microbial ingredient as it protects the skin from all types of bacteria, fungus, and viruses. It removes all such viruses and micro-organisms that can have an adverse effect on your skin and those which can cause skin-related diseases. Salicylic acid is also a very valuable ingredient in AHAVA Mineral Foot Cream. Its main function is that it removes all dead skin cells through gentle exfoliation and moisturizes the skin effectively. It also aids all the other ingredients found in this foot cream to travel to the underlayers of the skin so that they too can have positive and lasting effects on your skin. The AHAVA Mineral Foot Cream contains all these ingredients most of which come from the Dead Sea, and they all will have a conclusive effect on your skin. All these ingredients are combined to make a formula which heals uncomfortable cracks and provides relaxation as well as deeply moisturizes your skin. These ingredients are what make AHAVA Mineral Foot Cream different. Although it is a foot cream, it can also be applied to your elbows and knees to cure dry and irritated skin. The AHAVA Mineral Foot Cream can be applied to the whole foot, from the heel to the toenail. The AHAVA Mineral Foot Cream is suitable for all those people who want an efficient, fast working, nourishing cream which has a lovely and sweet fragrance. The AHAVA Mineral Foot Cream can be applied in the same way as all other creams. The foot cream has a formula which contains relaxing and nourishing ingredients which can help to keep your skin hydrated. In order to get the most impressive results, you can apply this cream according to your needs. Before applying the cream, you need to make sure that you have cleaned your feet. You can apply this cream on your whole foot but make sure that you apply it on your soles and heels as these parts have the driest skin. You can apply this cream whenever you wish, but it is advisable to apply it in the morning and at night. There are many advantages of using the AHAVA Mineral Foot Cream. This foot cream can be used daily without any fear of the cream having a harmful effect on your skin. The foot cream also deeply moisturizes your skin, making it softer and smoother and also removes all dryness, making it look younger. The formula for this cream is particularly designed for the feet, but it can also be applied to your elbows and knees. The cream is not greasy at all. In fact, it contains natural ingredients which have an effective, soothing, and positive effect on your skin. This cream is also one of the top sellers as it is Paraben and SLS/SELS free. It also does not contain any allergens, nor it contains any petroleum-based ingredients, GMOs or harsh synthetic chemicals. This cream has also been endorsed for all skin types so you can use this cream even if you have sensitive skin. Lastly, this cream is also animal-cruelty free. Every coin has two sides; thus, there are also some disadvantages of using the AHAVA Mineral Foot Cream. One of its downsides is that the tube does not last for very long. You can take advantage of its relaxing and soothing effects but only for a short time. Soon, you will have to purchase another tube. Who is the AHAVA Mineral Foot Cream for? Everyone can use the AHAVA Mineral Foot Cream. The foot cream is suitable for those people who have dry skin or have cracked heels. Even if you have sensitive skin, there is no need to worry. Applying a substantial amount of this cream is safe. Even if you have smooth and well-hydrated skin, you need to make sure that your skin does not become dry and your feet stay moisturized and hydrated all the time. Are there any harmful effects of using this cream? As this cream is applied externally, there are always some concerns about whether this cream will have any adverse effects on the skin. It is safe to say that as the AHAVA Mineral Foot Cream contains natural ingredients, there are no adverse effects on the skin, even if you have sensitive skin, or have applied a large amount. The Mineral Foot Cream by AHAVA is a good product which has a positive effect on your skin. If you are suffering from dry skin or cracked heels, this cream works as an effective moisturizer, making your skin softer and smoother. Taking care of your feet will surely help to not only make your feet look healthy but will also help with stress and fatigue. This cream also removes dead skin cells and protects your skin from all types of fungus, viruses, and bacteria. 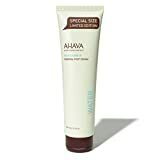 This cream by AHAVA also has a soothing and relaxing effect, and it cures red or itchy spots, and callouses. Most importantly it is a good way to treat dry skin and cracked heels.